What a fine example of the delightfully simple! Two pieces of milk bread, some whipped cream, and some fresh strawberries. Nothing more than is required, and it’s presented in a serving size that suggests it’s a treat. Fresh strawberries have a bit of bite to them, and that firm body is key to keeping things from getting sloppy. Berries previously frozen or stored in juice would quickly render this sandwich a big mess, but there’s no such mistake made at Clover Bakery. There’s not much to be said here,we just have a sandwich that would be more than welcome next to the right cup of tea or disgetif. 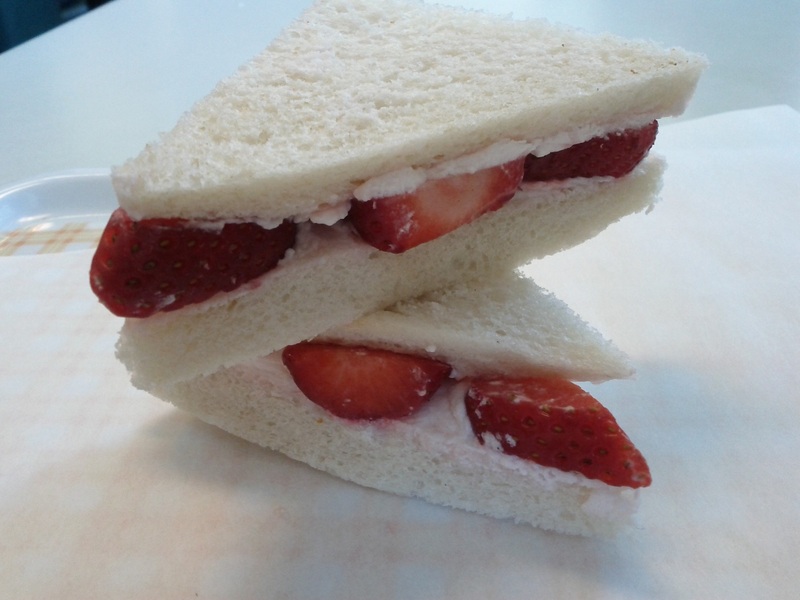 Sandwiches don’t often make their way directly into the dessert course, but they do show up in a certain sort of way, in sandwich cookies or other confectionery treats. Here we see proof, though, that a sandwich infrequently seen is hardly unwelcome. I’ve been so impressed by previous visits to Little Chef Counter that as soon as I notice a new sandwich on the ever-changing menu I head over to give it a try. The braised short rib was delightful, the mushroom sandwich delicious, and the breakfast sandwich well executed. 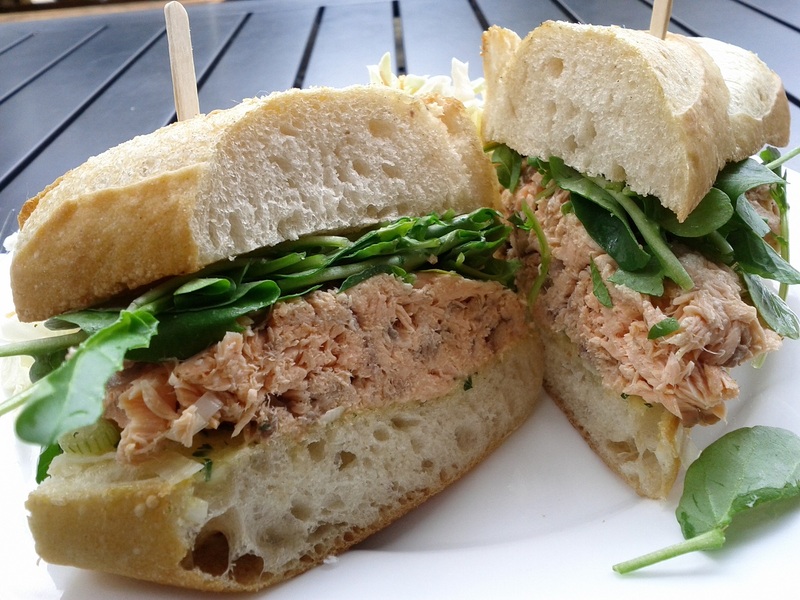 The smoked salmon sandwich is the latest, with salmon joined by basil aioli, watercress, and spring onions on the same roll featured in previous sandwiches. Sadly, the law of averages has struck. This was a disappointment, the salmon dry, the basil almost unnoticeable, the spring onion similarly scarce. It functions as a salmon sandwich, but that’s the only note. Dressing the salmon in the basil aioli would have gone a long way, although I can understand the hesitation to do such a thing. The sandwich was just missing something to stand up against the salmon; something peppery or a mustard vinaigrette would have gone a long way. I suppose a sub-par sandwich from Little Chef Counter was inevitable, but it’s sad to see. My opinion might be colored in the tiniest bit by the fact that this replaced the mushroom sandwich on the menu, that was mighty tasty and this is a big step down. All that said, Little Chef Counter still has a pretty good record and the next time a new sandwich comes up on the menu, you can be sure that I’ll head there with all due haste. For all of the boasting of imported rolls, the sandwich is missing something some essence of Philadelphia. It isn’t aggressive. The cheese is only overwhelming at the occasional bite. Grease may leak out, but the sandwich itself holds together nicely, the portions are sensible and easily managed. Upon finishing the sandwich I was satisfied, but I did not sit back and let loose one big sigh and two or three cusses. And that, as you might imagine, is a far cry from Philadelphia. 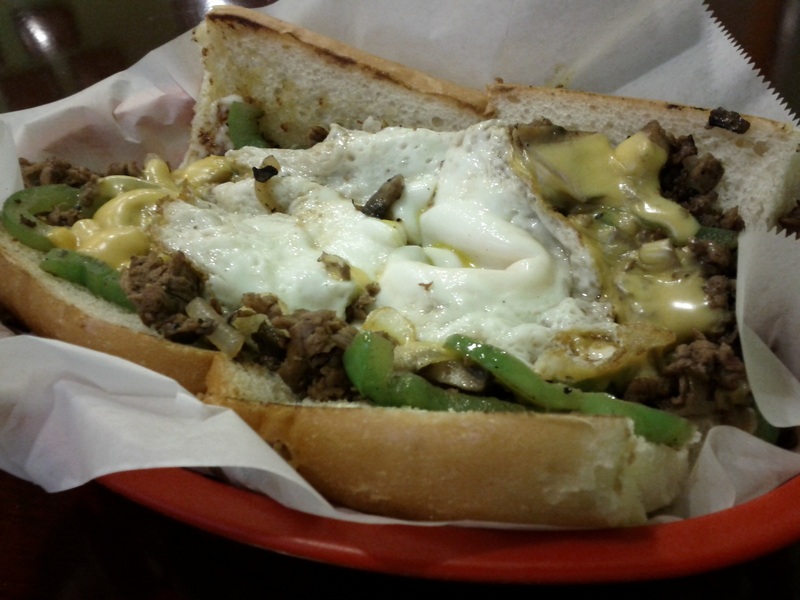 This sandwich may be enough to impress someone who has never been to the city of brotherly love, but that isn’t me. I’ve been to Philadelphia, and “sensible” isn’t a word you would use to describe a cheese steak. Hoagie Steak Out, thankfully, is a place that understands this. The Rising Sun is listed as a special, and it includes steak, sauteed mushrooms, bell peppers, and onions, plus a fried egg. That’s a lot for a toasted hoagie roll to handle; a sandwich like that is a fairly large gamble. I have to say I was quite pleased with what I received. It was loaded from the side, which is never my preference, but picking it up and closing it like a proper sandwich set things right. It gave the layers a symmetry: steak, then the mushroom/onion/pepper mix, then the cheese, then the fried egg, then cheese again, veggies, steak, and back to the roll. The warm yolk lay at the center, radiating richness. I don’t know whether this is an accident of construction or a deliberate stroke, but in either case the effect is delightful. The steak is the typical dry sort of stuff you find on a cheese steak, but it’s well grilled and plentiful. There wasn’t too much cheese, which is a concern on any sandwich, namesake be damned. There wasn’t enough mushroom, but having enough mushroom is a very rare thing. As a whole, it was well balanced, greasy but not excessively so, rich but not overwhelming, substantial but not falling apart. Anyone who’s been to Philadelphia can wear your ear off grousing about the city or its inhabitants, but for all of that, people keep going. Fact is, the city is an odd kind of charming. There’s much not to like, and much more that would be very easy not to like if it went a little bit farther than it does, but it doesn’t. And so it was that I found a distinctly Philadelphian sandwich in an establishment making no boasts of authenticity at all. Rather than presenting ingredients listed by provenance, Hoagie Steak Out simply presents something that could be a giant, disgusting mess, but isn’t. The sandwich carries an implication, and it is well understood. I want to specifically point out the difference between the eggs here and the eggs from Monday’s sandwich. Forget the spinach. One of these places is making an effort, and the other isn’t. And this isn’t a case of “well they aim for gourmet, and we’re just a cafe.” Scrambled eggs are scrambled eggs, and they aren’t tremendously difficult to do well. 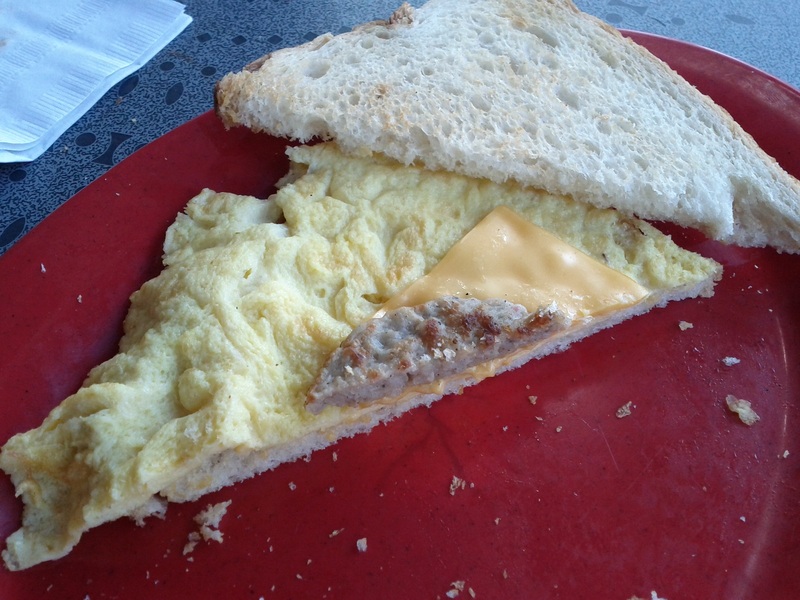 (Perfect scrambled eggs are hard. Good ones are not.) Bacon is more welcome than not on a breakfast sandwich, and the choice of roll was a subtle thing a lot of places aren’t going to pick up on. 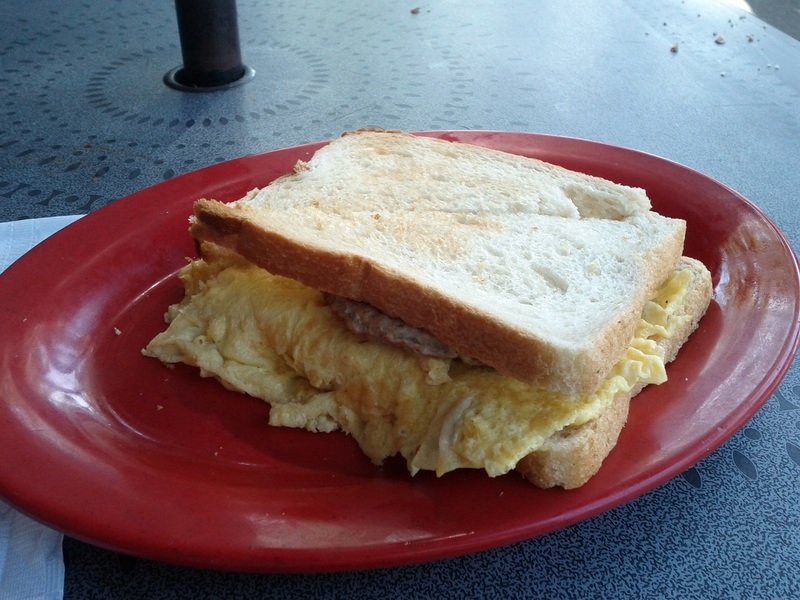 It’s soft and yielding, so the actual holding and consuming of the sandwich don’t send the eggs sliding everywhere. That, in turn, allows for softer, fluffier eggs. It’s the kind of touch that shows a bit of thought went into things, and if more folks were committed to doing just that, we’d all have more tasty, tasty sandwiches like this one. Little Chef Counter is now three for three with sandwiches, and if you’re a sandwich enthusiast in the bay area I suggest you give them a shot yourself. This sandwich was six dollars, and from the outside that seems almost reasonable. But looking inside revealed that my six dollars had bought me two rather large pieces of bread, but a single slice of cheese and a single sausage patty. There are ample eggs, but eggs are almost certainly the cheapest part and amping them up in an attempt to simulate value just throws off the whole balance of the sandwich. So the second half of my sandwich got a sliver of sausage, a corner of cheese, and not much else. It’s up to each individual establishment to decide just what their product is worth, but whether or not the value offered is reasonable is my decision. If this had been served on smaller bread or an English muffin and been four dollars, I wouldn’t have an issue. I would have eaten it and been on my way, happy as a clam. But instead I confronted the above, two meager accouterments on an expansive of eggs. (The eggs were a bit flat and dry, compounding the sin.) So instead of enjoying a nice breakfast sandwich I just stared at the above, thought about my beloved (and cheap) two eggs on a roll, and was disappointed. And being disappointed by a breakfast sandwich is a remarkably poor way to start one’s day. 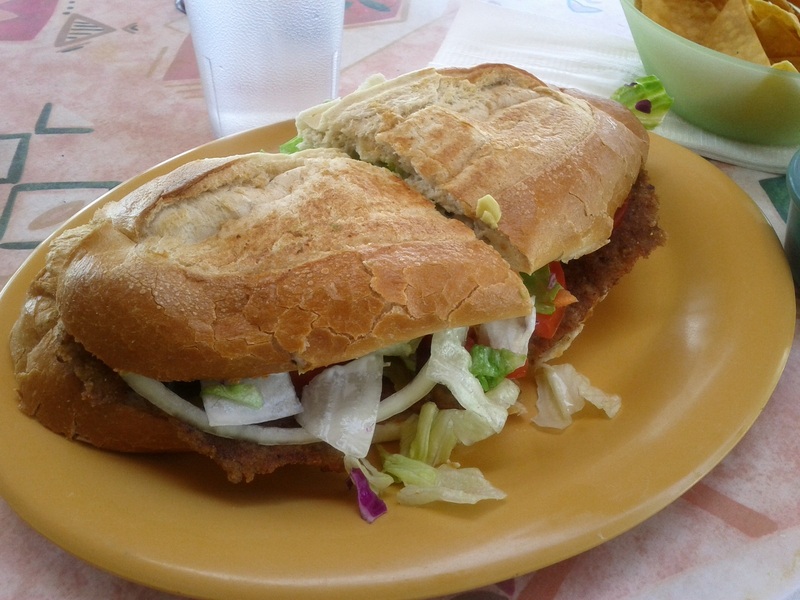 We return to the torta milanesa, previously seen here, here, and first here. I’m still searching for the perfect milanesa, and I’ve given up looking at counter-with-menu-board style establishments. There might be a winner out there, but I think I’m much more likely to find a long line of places with pre-fried ingredients getting soggy, waiting for me to show up. Better to go to an establishment with table service, wait a little longer, and get something made to order. That was what I got at Tacos Autlense, and it made a big difference. The beef was pounded incredibly thin, and if this was for reasons of cost control I’m not complaining. The result was an unbelievably crisp milanesa, with a deep brown crust. That was the high point of the sandwich, although the rest of it wasn’t bad at all. There was table cream, but not nearly so much as I found at Taqueria Tlaquepaque. It was just the right amount, with the creamy tang contrasting the well seasoned crisp of the steak quite well. The sandwich, like the one from Mexico Bakery, was primarily flavored by pickled jalapeño. That’s not a flavor I’m tremendously fond of, and the the vinegary heat kept me from enjoying the sandwich as much as I could. This same same sandwich presented with a good red sauce would be quite the number, I think. So it wasn’t a perfect torta, but it was a clear step up from some of the others I’ve had. It occurs to me that I might be dooming myself to this sort of scenario. What are the odds that I manage to find a string of taquerias that builds ever slowly to a transcendent experience? It seems much more likely that I simple build a catalog of tortas eaten, they fall into some jumble of rankings, and an endless pile of “Good, but not great.” piles up. There are larger questions here that this sandwich doesn’t come close to settling, but I suppose that’s the world of sandwiches sometimes. I seem to be having a bit of bad luck with the execution of sandwiches lately, as this is another fine idea for a sandwich that suffered as presented. Roast Beef, provolone and cream cheese join fresh mushrooms, bell peppers, red onion, pepperoncini, stone ground mustard and mayo on toasted ciabatta bread. The first thing I noted when I got the sandwich was that the crust was pale and soft, which is a bit uncommon for places that make some note of their baking. Thick crust is used to signal artisan or fancy bread, and that was lacking here. As it turned out, that was a good thing. You can see the excess mayo on the sandwich there, the top half of the roll was sliding around even as I took the picture. Upon my first bite that mayo sent half of the ingredients shooting out of the rear of the sandwich. I hadn’t run across this level of filling creep in quite a while, and needless to say I wasn’t pleased to see it again. Peppers, mushrooms, onion, pepperoncini, roast beef, all of it went sliding this way and that. Had the crust actually been a bit stronger I shudder to think of what a chore this sandwich would have been. Similar to the tragedy at On a Roll, what’s really terrible here is how simple this is to fix. Move either the roast beef or the mayo to the bottom and your problem is instantly solved. It’s the juxtaposition of the slick surface of the cold cuts against the slickness bread spread with mayo that’s at issue. There’d still be slippage if you piled the veggies on top, but nothing to the degree that you get with the roast beef. Specialty’s is a small chain, and I wonder how rigorous their preparation guidelines and recipes are. Is the roast beef on top mandatory? Did someone at this particular Specialty’s simply slip up? I pondered all of these questions as I chased sandwich ingredients around my plate, trying to pile them back on the roll for the next bite. I might remake this sandwich myself, just to see what it’s like with a bit more thought behind it. Alas, this particular experience was lost. I come to sandwiches to indulge, not to labor. I draw your attention to the scant strings of carrot on the sandwich. What you see there is the full extent of it, there’s none buried under anything and of course I made no adjustments to the sandwich before photographing it. The daikon and jalapeño weren’t exactly plentiful, but I cannot get over that shortage of carrot. 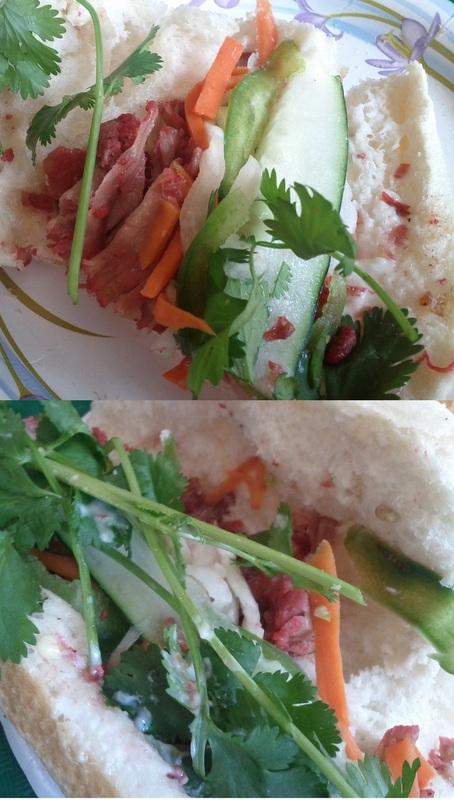 The bánh mí, as an archetype, is excuisitely balanced and included in that balance is a good deal of carrot. So why on earth would you leave it out? Carrots aren’t expensive, and even if they were, On a Roll is charging almost double what many establishments charge. I know the profit margins in the food game are slim, but there’s got to be room in those margins for a bit more carrot. The only excuse I can think of is sloppy execution, as I’ve found at places doing booming business. But that hardly describes On a Roll, which means that as this sandwich was assembled, someone had the time to look down at it and decide whether or not this was a proper sandwich. It’s too bad, really, because On a Roll gets the hard part of the sandwich wrong. Lackluster execution is lackluster execution, though, and in this case there’s no excuse I can see for what went wrong. Zanatto’s is an upscale grocery store, the kind of place with more imported products than average establishment and the atmosphere to match. There’s a counter off to one side, filled with premade sandwiches, pastries, and sweets. This was labeled as a portobello and brie panini, but as you can see by the bit of cheese poking out from under the mushroom up there, that’s no brie. No, it was something more mild, likely provolone, and like so much cheese it neither detracted from the sandwich nor added anything. The real story here is the mushroom, a monster of a cap that puts a great many other mushroom sandwiches to shame. Beyond sizable, it was the kind of meaty goodness that any mushroom enthusiast is perpetually seeking. There was a bit more that could have been done in execution, sadly, as the mushroom was a bit more wet than is ideal. Scoring the cap before grilling goes a long way. 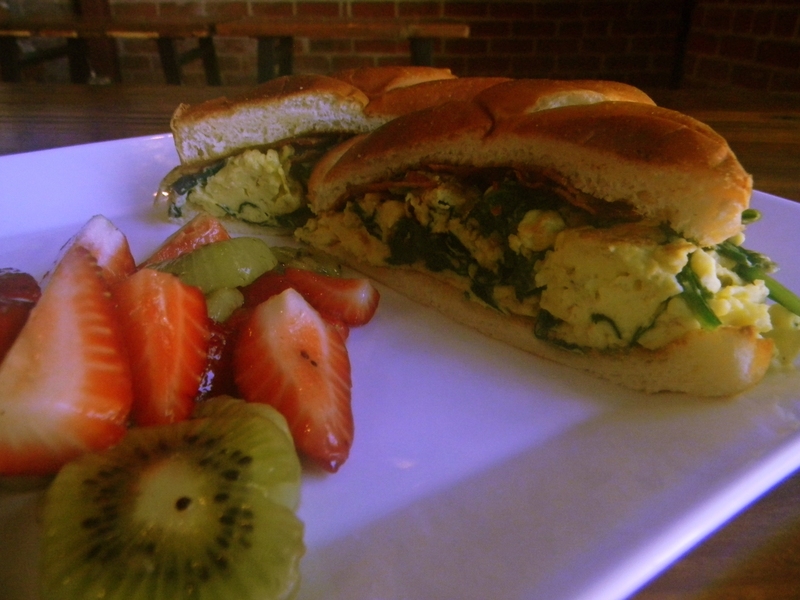 There were also scant few leaves of spinach on top, less than a half dozen per side of the sandwich. If you want to include spinach, then include the spinach. Nothing inside the sandwich ought to be there for decoration, after all. On the plus side, the sandwich included one of those hard-to-pin-down sandwich spreads, a concoction likely mayo based and with a good hint of red chilies. 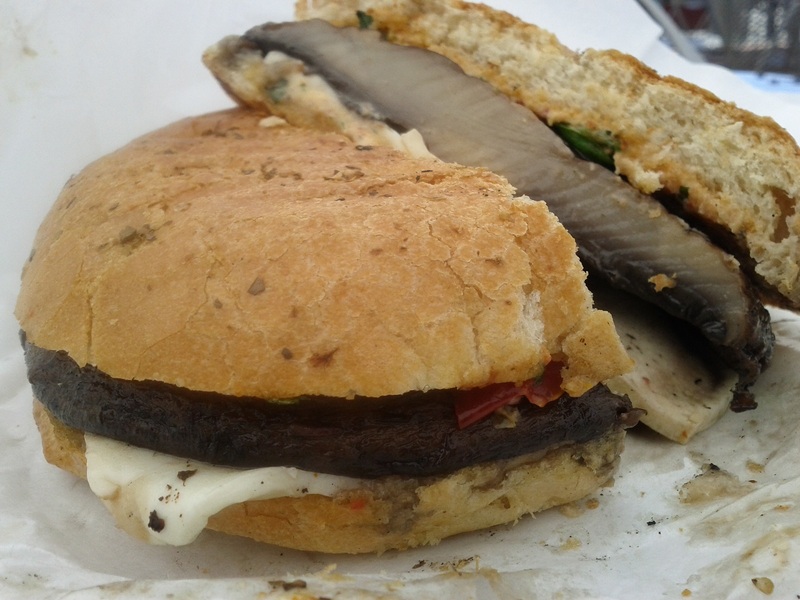 The combination of that and the inherent goodness of a huge mushroom was enough to overcome the faults of the sandwich, and in the end this was a mighty tasty panino. Pluto’s is one of those establishments with a make-your-own focus, presenting a long list of ingredients and suggesting you simply get whatever you like. They only have four sandwiches listed on the menu, one of them a weekly special. The Lunar Dip is their take on a French Dip, with grilled tri-tip in place of roast beef. 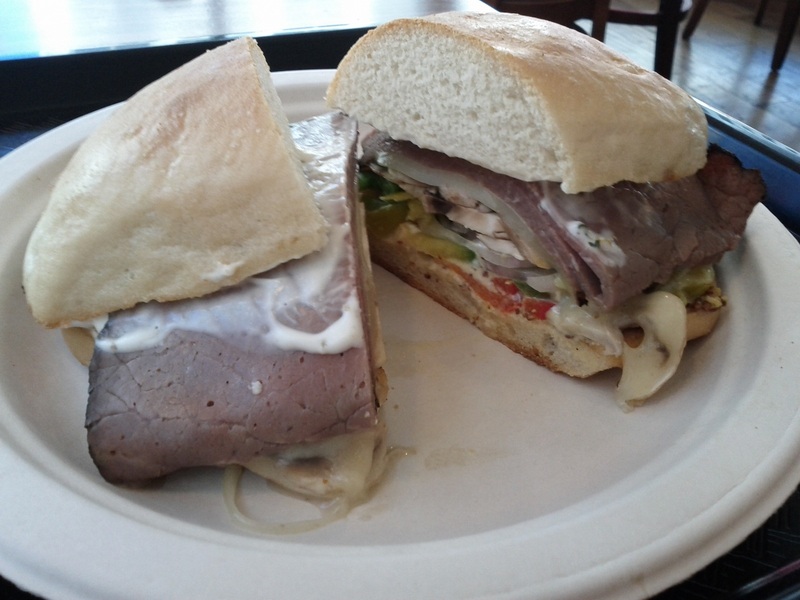 The spice-rubbed beef is accompanied by horseradish mayo and provolone cheese, and it’s served on ciabatta bread with a small cup of jus. First and foremost, I’d like to know how far one man has to wander to find an establishment willing to put more than a scattering of horseradish on a sandwich. Regular readers will recall that I have bemoaned a lack of horseradish several times, and Pluto’s appears to be another place committing that particular sin. I’m half inclined to think that this is just me, that I happen to really go wild for horseradish and I should stop holding against innocent eateries that the general public doesn’t share my predilection. But the other half of my inclination insists that the horseradish on this sandwich was genuinely scant. I’ve discussed before that while it rarely happens in real life, the platonic ideal of a sandwich includes a bit of each ingredient in every bite. Well, in this case the horseradish was absent from far more bites than for which it was present, and I struggle to accept that. “But that would be too much horseradish,” I can hear people saying. But most often what we are given is not horseradish itself but creamed horseradish or horseradish mayonnaise. And I put it to you that that is the perfect opportunity for any enterprise to tailor an even amount of horseradish, at any degree. The whole thing is wide open, and there’s really no excuse for failure. But enough of that. 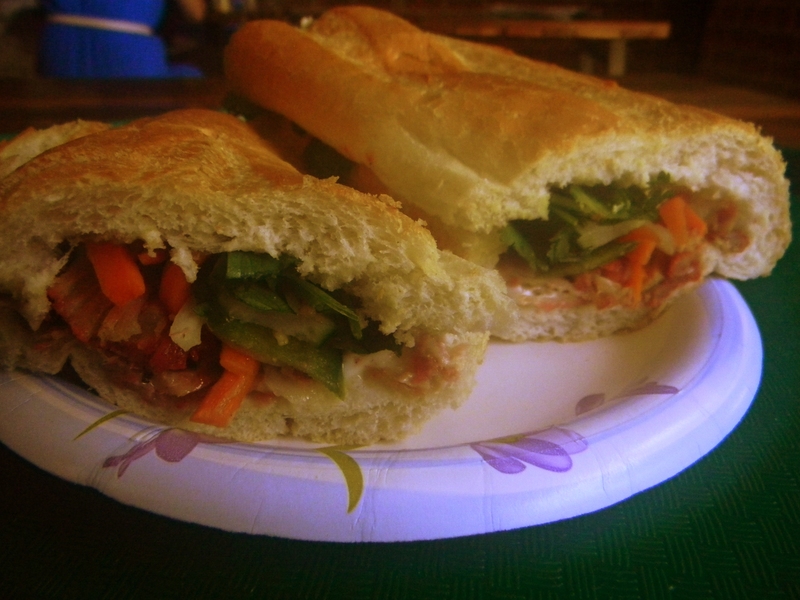 Setting aside that one issue, this was a tasty sandwich. The ultimate question governing any sandwich experience is “Was it satisfying?” and I have to say that this sandwich was. The ciabatta roll had a good crust to it but not so sturdy that every bite sent the sandwich sliding all over the place. 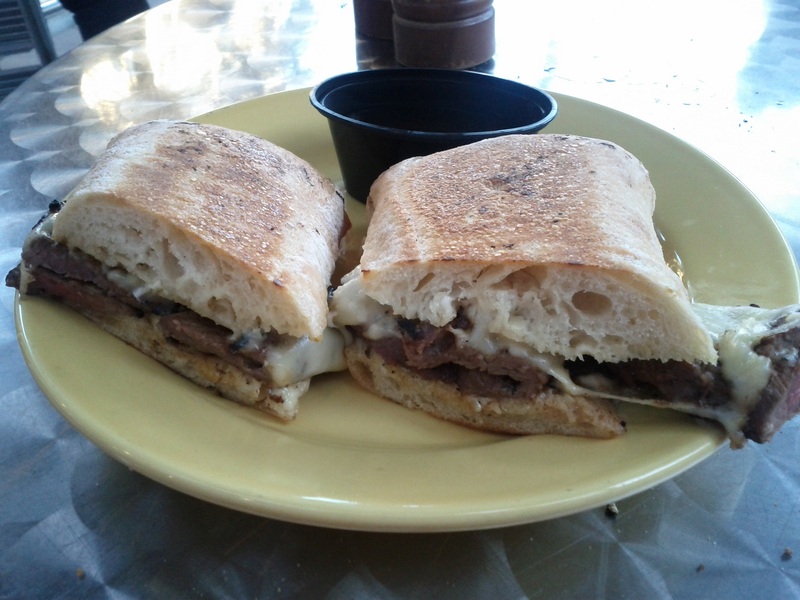 Provolone is mild and was present in a respectable amount, and the steak was well spiced and tender. The jus was warm, though not particularly flavorful in its own right. What’s more, the sandwich was a bargain. Given that it comes from Santana Row, a downtown-before-the-mall-killed-downtown upscale shopping development, a tri-tip sandwich for around six and half dollars is a good deal. Someday I’ll find a sandwich with all the horseradish my heart desires, but until that day, the Lunar Dip isn’t so bad.